Katherine here, roughly 40,000 miles above the Pacific Ocean. Everybody travels around the holidays . . . though I suppose the number of people who have checked bags filled with nothing but surveillance equipment and extra granola bars is significantly lower. When you’re a spy, you spend most of your time feeling removed from the rest of the world. You visit a lot of remote locations, you have to go weeks on end without seeing your friends or family, and you never manage to get caught up on your favorite TV shows. Even though it’s easy to feel hermetic when you’re off the grid, it’s important to remember that we’re all interconnected and that we need to be empathetic towards others. In case you missed it, Ahna and I had a conversation yesterday about how picture books can help facilitate understanding and compassion, especially in times of crisis. 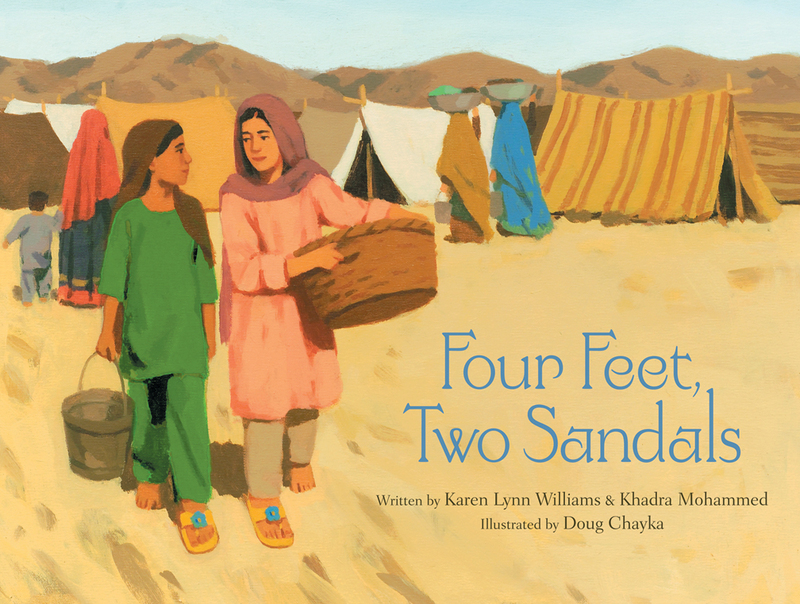 Two of the three books we mentioned in the video — Four Feet, Two Sandals and My Name Is Sangoel — were co-written by Karen Lynn Williams, and when you’re looking for more information, it’s a good idea to get in touch with the person who literally wrote the book on it. Karen, being the valuable asset and gracious person that she is, promptly and thoughtfully answered my many questions. Many of your books are focused on diverse characters and/or difficult topics. Why do you think these stories are important to share with young readers? Originally I was a little concerned about the nature of the material in some of my stories for young children. However, after visiting schools and sharing my picture books, I realize that most children are sensitive to the fact that there are other children out there who have difficult lives. They are not afraid of these topics, and they are able to identify with the problems others face. I don’t intend to spread unhappiness, but I have come to realize that it is important to raise compassionate young people. That might mean feeling some of the pain of others or feeling emotional. That is one thing I hope my books can do, help us all to be more compassionate. How are picture books particularly good at raising social awareness in children? A picture book can explore topics that help raise social awareness in a simple manner. They can provide an introduction to difficult topics and lead to discussion. If a young person wants to explore the topic on a deeper level, the opportunity is there in other books and materials. Also, illustrations can help make a topic meaningful without the full visual reality that might be presented on the screen or in the news. There is an artistic vision in picture books both in the language of the text and the illustrations beyond the stark (and sometimes graphic) reality of the world presented in the news. Many kids may have refugees entering their classrooms, just like Sangoel. Do you have any advice for teachers, parents, and students who are wondering how to make refugees feel welcome? Refugees need friends just like anyone else. Make sure they are welcome and included in activities. They may not understand English or customs. Help them to understand what is happening in social situations. Ask if they need help. Try to remember that almost everything will seem new to them even if that seems silly to you. Remember that they are suffering loss and coping with big changes in their lives. They may want to talk about the home they have left, or perhaps they are shy or trying to forget. Ask how you can help, what they need, and listen. Remember that not all refugees have had the same experience. Try to learn about the particular experience of your friends who are refugees. Do you have any advice for parents who aren’t sure how to discuss the refugee crisis with their children? A picture book read out loud with family is a comfortable way to broach topics like the refugee crisis. I would advise parents to share the books with their children and then ask if they have questions. Answer all their questions truthfully and make sure they know that if you don’t know the answers, you will help them find answers to difficult questions. Explore the ways you can help with the crisis if a child is interested in getting involved. Sometimes there are simple things a child can do: a letter or poem or picture to express how he or she feels about the situation. Perhaps a child can share an experience he or she has had that made them scared or lonely. Reading is a way to share the realities of our world. Sharing those realities with a trusted adult is a safe comfortable way to explore topics like the plight of refugees. 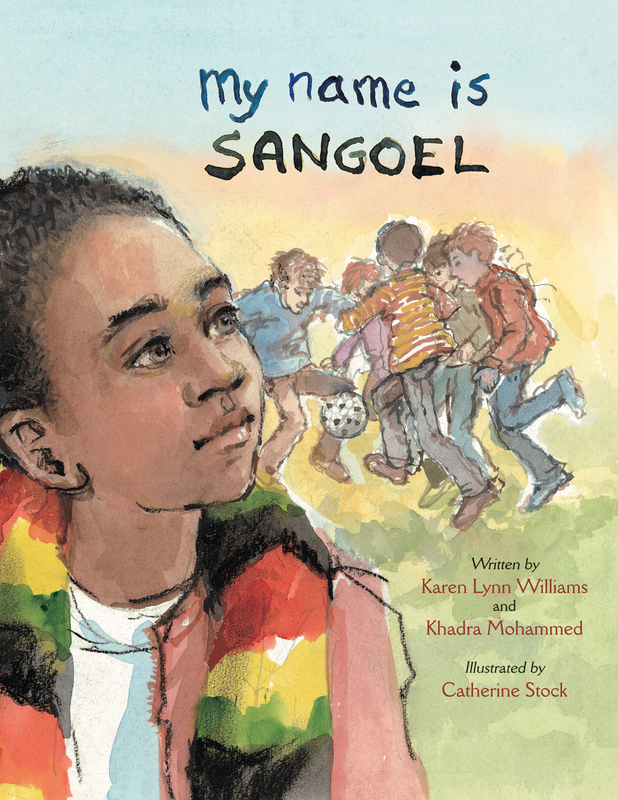 What’s something you hope readers take away from books like My Name Is Sangoel and Four Feet, Two Sandals? I hope that my readers will develop compassion for others as they read and share my books. I hope my books will help prepare them in some small way for a world that is becoming more and more global and help them to better understand and respond to that world. Classrooms in the US are becoming more and more diverse. I hope that my books will help young people embrace and learn from the diversity. A special thanks to Karen for the wonderful insights and for the reminder that we should never stop seeking to understand. As someone who is well-trained in the art of seeking (and about to put her night-vision goggles to good use as soon as her plane lands), that is a philosophy I can get behind. Until next time.